We looked at the top 1 Tower Fans and dug through the reviews from 9 of the most popular review sites including BestReviews, Top Ten Reviews, The Z9, Jen Reviews, Chooserly, Air Needs, Easy Home, Home Expert Reviews and more. Through this analysis, we've determined the best Tower Fan you should buy. In our analysis of 76 expert reviews, the Arctic-Pro Arctic-Pro Digital Screen Oscillating Tower Fan placed 7th when we looked at the top 10 products in the category. For the full ranking, see below. This tower fan is 42-inches tall and is equipped with a night mode for energy saving purposes. This is possible since the digital screen turns off even when the fan is working, and you are taking a deep sleep. The control panel includes a digital screen that clearly shows the temperature of the air blowing through the vents. Bar graphics clearly show if the speed is set to low, medium or high, so you can see it from across the room. This fan has three speeds, which is plenty for most people. You can configure the stand to sit lower to the ground if you want coverage lower down. With three speed settings and 80 degrees of oscillation you can get an excellent amount of airflow and circulation throughout your room. Manufactured to deliver optimum quality and quantity of air, the Arctic-Pro oscillates to 80-degrees to allow proper circulation of air, covering wide radius of your home or office. Improper packaging might be a disappointment for a few users. Assembly took longer than average on this fan as the stand was complicated to put together. The manual has instructions, but the graphics are tiny and didn’t help as much as we would have liked. The Arctic-Pro tower fan with remote control sits 42" off the ground to provide you with a wide range air distribution. The modern design will fit into most home environments and with a minimal footprint you can expect it won't take up much space. Engineered to generate more air with a lot less noise than other fans. 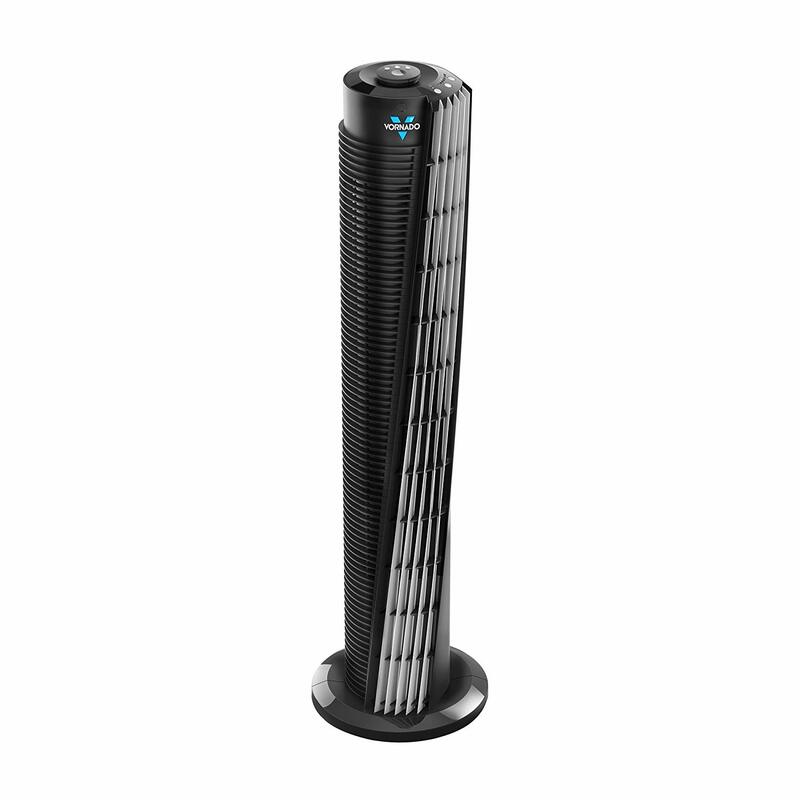 The Arctic-Pro oscillates 80 degrees to circulate the air throughout your home or office. Comes with a remote control and a digital screen. Hold down the Mode button for 5 seconds to get Night Mode, to turn off the screen. To illuminate the screen just hit the mode button once more. Color: Graphite gray. Size: 42 Inches high, 12 inch base, Fan Cylinder is 6.5 inches in diameter. Assembly is Required: 6-9 Minutes. NOTE: PLEASE OPEN BOTH ENDS OF THE BOX FOR ALL THE PARTS.